As any modern woman knows, we seem to be sadly attached at the hip not to our loved ones, but our computers and mobile phones. While our other halves, friends and children bring joy to our lives, computers, iPads and mobile phones have not just a practical effect, but negative one as well, in the form of blue light & zapping our energy with prolonged use, as well as contributing to a sedately lifestyle, the effect of which, among other facts, won’t be known for many years. 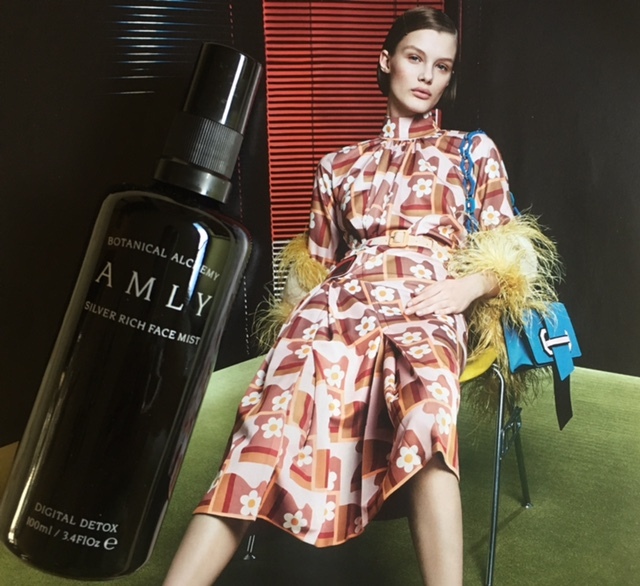 As I am one of those people whop spends a fair amount of time in front of her laptop daily, I was intrigued to test the latest launch from the British brand Amly, whose Radiance Boost Silver Rich Facial Mist has become my regular daily and travel companion since its launch last year. Now I welcome Digital Detox into my facial mist family fold. Beneath an organic wildflower meadow in East Sussex, comes a source of naturally silver-rich water. This unique self-replenishing supply filters through layers of ancient mineral-rich rock, making it a pure source of natural trace elements and minerals, all of which help to sooth, revitalise and purify not just your complexion, but your senses as well. When I think of the word mist, I imagine clear & refreshing rain droplets on my face, hydrating & refreshing the skin, while washing the negativity away, as you loose yourself in the precious moment of just being. It took Amly founders Kerry Moore (a specialist in Biodynamic craniosacral therapy and homeopathy background) & Lisa Smallpiece (an artist & resident of the organic farm attached to Amly), two years to refine & research the perfect combination of ingredients that jointly offer anti-pollution & stress-combating treatment to the skin, protecting it against the damaging effect of modern urban living, office work & constant digital presence that sadly seems to be on the rise, as we all try to keep up with the pace. But its not just the artificial light that our computers & mobile gadgets, as well as TV screens emit, its also the electromagnetic radiation. If your skin is already dry or irritated, those problems, compounded by the negative effect of daily environmental aggressors, become worse and more noticeable to you when you examine your skin in the mirror. Lisa & Kerry don’t believe in launching products just because this is expected from them as a brand – after all, they launched not with a plethora, but with just one products to start with. Creating products that help your skin look and feel better, as well as have a positive effect on your body via your senses is what truly matters. Digital Detox builds on nature’s ability to refresh and replenish, by utilising hydrating marine actives, purifying magnesium salts and energising oils that together have a powerful effect on you, as you inhale the vibrant floral scent, close your eyes and allow your features to relax into a contented smile. At times I simply continue misting my face and decollate gently humming ‘OM’, be it with my feet firmly planted on the floor under my desk or sitting on my yoga mat in the evening. It is one of those easily accessible tools that become second nature and make you feel better in your skin – be it at home, on the tube or plane, or while toiling away in the office. When you use Digital Detox mist for the first time, shake the bottle gently but firmly, close your eyes and spray liberally, while taking deeper breaths and allowing the aromatic oils to stimulate your senses and giving your mind a temporary respite from whatever you have been focussing on. Try to focus on deciphering the scent and notice energy-cleansing Frankincense, Yarrow and Niaouli; Refreshing yet calming, this clarifying spritz blends together Juniper, Cedarwood and Ginseng which aid concentration, while Rose Quartz, Orange Blossom and Ylang Ylang are valued for their harmonising and anti-stress properties. Life is hectic, we all say this out loud, instead of greeting each other nowadays, so use this to ground, energise and calm yourself before you get on with the tasks at hand. I spray it on my face sometimes in the morning, instead of the tonic, but most often it stays by my side, like a cacti, next to my laptop and when I feel that my mind wants to wonder to the social media or web pages away from work, I take a few moments to mist my face and centre myself, before continuing with the task that needs attention or completion. This mist is very fine and the particles seem to sink into your skin almost as soon as they land on it, which gives a lovely, calming sensation to the skin. I also have another trick up my sleeve when it comes to using this mist – there are times when I feel angry or hyper and instead of raising my voice, I mist my face and it seems to silence the roaring giant that wants to escape from the back of my throat. While it doesn’t necessarily prevented a conflict from erupting – after all, I can’t say to a client or a person with whom I might have an unpleasant conversation – ‘wait a moment, let me ground myself before we continue this conversation’, it has stopped me in the tracks on a few occasions when kids tested my patience. On occasion this action on my part made them stop their tantrum mid-way and focus on examining my ‘I don’t care right now, I am trying to be zen’ face. Each batch of the product takes about eight weeks to be prepared, as it undergoes the resting phase & infusion after the wash phase, with Kerry & Lisa renewing the process every four weeks, so a new batch is ready every month. It just shows that in the ever-increasing pace of life some things require not just effort, but time to be ready, without compromise on the quality or the results you might expect from the product. Now, last but not least, a few words on the natural actives and ingredients, that make this mist such a luxuriously indulgent pleasure of daily life. Rose Quartz has been used since ancient times to uplift the senses 7 balance the emotional state, while also offering a protective frequency to the product which has been infused with it.